"Our product is unique thanks to the ease of use, making translation just a click away. The product has no competition in the digital world. It's a combination of encyclopedia and dictionary, allowing the user to receive a translation and information from dictionaries and encyclopedias in several languages – with a single click. The company has a linguistics department in charge of developing and adapting the existing dictionaries and improving them. "Our company is young, dynamic and innovative, and the product is its great pride – the fruits of Israeli development marketed in over 170 countries and operating in dynamic and renewing markets." How is the product designed? "Babylon has a linguistics department in charge of developing the dictionaries as well as adapting and improving existing dictionaries. The department has speakers of over seven different languages." Sales are carried out not just on the Internet? "That's right. The software is also sold in stores as a shelf product, offering the program in an attractive box. Our marketing setup is very developed. There are salespeople who offer the program to large organizations and an Internet sales system that markets to the general public via the Web." At an Internet marketing conference a few months ago sponsored by the Export Institution, Babylon was cited as an example of a company that focuses on Web marketing. At the conference the company's vice president of marketing said, "The Babylon label is built only through the Internet. We haven’t run press ads or billboards, we haven't printed brochures or other advertising material. The public relations budgets have been substantially lower thanks to the Internet. In the final analysis Internet means a lot fewer business trips are needed, and this is a company whose products are sold in 170 countries." There's not much turnover at the company. Carmit Hadar: "That's right. We have programmers who have worked at the company since it's founding. The goal is to preserve this tradition. People love the product. It's not just another antivirus program. Many of our employees noted in their interviews before they were hired that because they were satisfied users and loved the program they wanted to become a part of the company staff. That means keeping the workers at the company does not stem only from worker management, but also from its special product." You told me employee recruitment is one of the central areas of activity for the human resources department. It would appear not too many employees are recruited at a company with less than a hundred workers and a relatively low turnover rate. "We recruit about ten employees per year and some of these are not due to people leaving, but following a promotion or a development in new directions and new products at the company. Still, there is relatively significant recruitment activity because we invest a whole lot in the recruitment of every employee." How is the recruitment process carried out? "We make extensive use of employee referrals. Most of our workers come to us this way. We have regular coordinating meetings with company employees and through them this type of information is passed on as well. Department meetings are held once a week and general meetings once a month. "We also send employees internal e-mail messages listing the specific requirements of the position. They take it from there. "Success in placement (i.e. the new employee works for at least three months) entitles the employee who made the recommendation to a monetary bonus. We also work with placement companies, including Internet companies." Why don't you wait for the employee referral program to prove itself first? In most cases it works. "In the first week after the position is advertised we only reply to employee referral applicants. We contact placement companies at the same time because it takes time until the request to man a position registers at the company. If the second week arrives and there are no results through the employee referral program, the placement companies can start offering their candidates right away. For me, personally, it's convenient to work with them because I know them well. I used to work at one of these companies." You're looking only for skilled workers? "Yes. People with experience at Internet companies. There aren't a whole lot of Internet companies in Israel, maybe a dozen, and of these we have to find people who are suitable for our needs. The supply is limited." Since this is a field with relatively few employers, isn't there a tacit agreement among the Internet companies not to take workers from one another? "I'm happy to say there are no competing companies in the specific field we work in. Most Internet companies in Israel are not direct competitors. In certain cases of a candidate from a similar company the matter is discussed with the CEO." Why do you need only experienced workers? "We need someone who knows and has experienced the mode of thinking and action of the Internet user. That can only be someone with real experience who has lived in an Internet environment. Those who worked at large software companies don't have that kind of experience." Why can't you train inexperienced workers? Why do you have to take them from Internet companies? "Because an experienced worker provides output almost immediately while a worker who has to be trained provides the desired output after several months. To train a C++ graduate for our work environment takes an average of six months, and like in all other matters, time is money." But at your company he stays on for a long time, so maybe it's not so bad to invest in him a bit more. 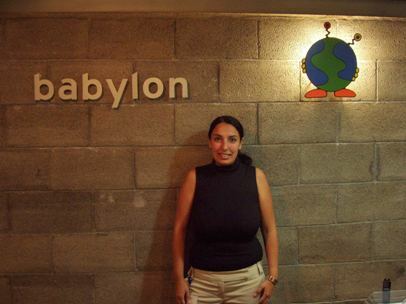 "A worker without experience develops at Babylon, but we're seeking a mutual contribution – the company benefits from the employee's experience and the employee learns from the company's experience. It's true an employee like this costs more, but it's worth it to us." How many candidates apply for every position? For every position we receive 90 applications, about 30% through employee referrals. About 20-30 reach the company interview stage. Here the candidate undergoes several screening phases. Some candidates are interviewed three times: by the immediate supervisor (the head of the prospective team) a human resources person and even the department vice president." Does the organizational culture at the Internet companies from which candidates come to you differ significantly from one company to another? "Yes. Although there are many characteristics held in common from a professional standpoint, there are substantial differences in the organizational culture. When we assess potential employee's application, weight is given to the environment where they worked and the standards they got used to. "For example, our organizational culture is distinguished by its creed that one must find the right balance between one's professional life and one's personal life, and not work hours into the night." Is that the accepted standard at high-tech companies – working late hours? "In many cases. At most high-tech companies the managers expect the employees to work long hours because their pay is relatively high and because they receive a set compensation package. We don't place such expectations on Babylon employees. If there are cases where hard work is required because we have to rush to put a new version on the market, then employees will even sleep here, but that's a rarity. Babylon maintains a balance between work and personal life, and both sides gain from it." One of the main reasons for having a performance evaluation system at a company is to map employees' abilities. It's needed at a large company because the management apparatuses cannot be familiar with each and every worker. It also allows them to plan mobility and promotion tracks within the company. At a small company where everybody knows everybody else, there is little need for this. Nevertheless a few months ago Babylon began to execute performance evaluations. Why? "For other reasons. For example, how am I to know if an employee is unhappy, that there are things that are bothering him? You cannot rely on these kinds of things coming up in day-to-day life on the job. But in an orderly process like this it will come up, making it possible to rectify. Therefore having a feedback process doesn't depend on the size of company; it's an important process at any place where there are employee/employer relations." But it's another task for the managers, a task they haven't had to execute until now. How did they react to the initiative? "They reacted positively, particularly in light of the recognition and the understanding that this is an important process in making the employees content." How many people does each manager evaluate? "Staff heads evaluate between four and ten people per year, depending on the size of their staff. We do it gradually. At the beginning of the process the managers receive a comprehensive evaluation questionnaire. When I saw there was too much contents and criticism I collected them and went back to the managers with a form that has ten sections and everything worked out. You have to realize complicated feedback processes cannot be foisted on the managers." Is there a connection between the performance evaluations and salary meetings? "None at all. Therefore we put a significant period of time between the salary talks and the performance feedbacks. There are companies that want to create a separation like this, but carry out these two management tasks with a short interval of time in between. In such situations you cannot expect the employee not to get upset over not receiving a raise after getting a positive evaluation. On the other hand, when there are four months separating the two, like at Babylon, this kind of problem does not arise. "The feedback is intended to strengthen the manager and the employee, and encourage them to improve processes and performance, not to form a basis for salary talks. Therefore the evaluations are not quantitative but qualitative."